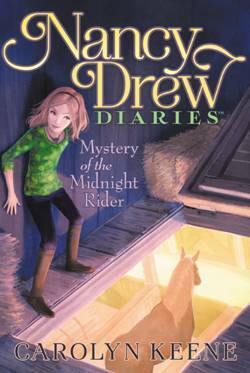 Nancy Drew is back with her latest mystery. I will admit to being a big Nancy Drew reader when I was young, so I am always keen to see how the new versions shape up. This story feels to me like the Nancy Drew of old. Nancy and her trusted sidekicks Bess and George have been invited on the maiden voyage of the brand new cruise liner the Arctic Star. The cruise has been receiving threats and Nancy and her cousins are there to find out who is behind it. There's a dead body in the pool (turns out to be a dummy), Nancy nearly gets knocked out by a falling moose head on the mini gold course, and a giant spider gets loose in the buffet! It's all very 'old school' mystery with a few red herrings thrown in for good measure. I liked it a lot, and apart from the introduction of mobile phones and email, I don't think Nancy Drew has changed that much at all, and for me that's a good thing. Two more titles due in May, Strangers On a Train continues Nancy's Alaskan adventure, while the action of Mystery of the Midnight Rider takes place at the River Heights Horse Show.